Plexus VitalBiome Review: Is it Really that Effective? Plexus BitalBiome is an eight strains probiotic dietary supplement aimed at relieving stress and boosting mood by reducing anxiety and depression symptoms. It is said to help enhance gastrointestinal health and gut health, as well as improve a person’s immune system, according to the manufacturer. In reference to different pieces of findings, the producer of this dietary supplement says our gut health can influence our lives the same way other parts of our internal bodies can. As such, this product is said to be able to improve not only the gut health but the overall health of the user. Plexus is the manufacturer of this particular supplement along with other supplements that are meant to benefit the body. The company has its website filled with lots of important information and that they sell this and other products through retailer sites. In overview, Plexus as a company seems to be a genuine seller and that there are a few or no complaints about most of their products. The manufacturer is very open with the ingredients used to manufacture their products, something that most companies are shy of doing. However, some of their products come with a caution but the same are also highlight and the precautions for users to take given. There is so much more to the bloating some people often experience and that is why gut health is so emphasized allover, from your doctor’s office to the media. It is well known by most people that there are natural probiotics such as cultured milk and yoghurt. These are good, but today some supplements are manufactured in pill form. 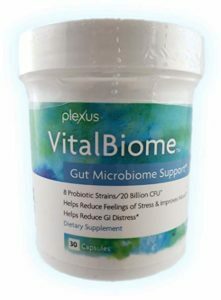 An example of such probiotics is Plexus VitalBiome probiotic supplement. In this article, we are going to dig deeper and see how much the product has to offer. But in precise what the company is telling its customers is that VitalBiome is capable of getting rid of anxiety, gastrointestinal issues and also help to resolve immune problems. So How Does Plexus VitalBiome Work? As mentioned earlier in this article, the supplement is said to work by adding beneficial or good bacteria to the digestive system. The good bacteria is then claimed to get rid of the harmful bacteria in the gut. The harmful bacteria is claimed to cause stomach upsets such as bloating and gas. This, in simple terms, means that Plexus VitalBiome helps you in dealing with gastrointestinal issues such as having gas, bloating and other digestive problems. Such problems are known to cause a lot of discomfort to people suffering from them. This probiotic supplement helps in eradicating such discomforts and later giving you a healthy digestive system and the overall wellbeing of the body. This is probably the reason why the manufacturer claims that the supplement enhances one’s moods. Lactobacillus Acidophilus – this ingredient is claimed to help with diarrhea and constipation. The ingredient also has properties that are capable of dealing with depression and lower Cholesterol levels. This means that while using the Plexus VitalBiome, you might experience some weight loss. (Side note: also labeled as Lactobacillus helveticus (R0052). Bacillus Coagulans2 – some of the primary functions of this ingredient is eradicating irritable bowel movements and constipation. Some minor roles include muscle recovery, relieving some common symptoms of Rheumatoid Arthritis and lowering cholesterol levels. This ingredient is mostly labeled as Bacillus coagulants (MTCC 5856). Lactobacillus Helveticus (R0052) – It helps to eliminate anxiety and reduce depression. Bifidobacterium Lactis – this ingredient supports the supplement in reducing or preventing diarrhea. Labeled as BI-04&BI-07). The above are some of the key ingredients that are found in this supplement. Other vital components include Saccharomyces Boulardii and Bifidobacterium Lango. The supplement is said to boost full digestion which in return reduces cases of bloating and gas in the digestive system. The company offers a 60-day money back guarantee on their products including this Probiotic supplement. This means that you can choose to return this product within 60 days and be offered your money back. The manufacturer has an open website where you can find more about the products they offer. Some users might experience some mild side effects, but they are said to subside in a short time. 1 Q. How to use and when to take Plexus VitalBiome? The manufacturer suggests that one capsule should be taken in the evening after meals or during bedtime when the acidity of the stomach is low. 2 Q. I am allergic to a lot of things, am I guaranteed that I will be safe after using it? For highly allergic people it is recommended that you visit a medical practitioner for further advice. 3 Q. I am a nursing mother or pregnant can I use this product? You should seek medical attention before using it. This way you will be more informed on the effects that will be experienced after taking the supplement. 4 Q. How long before I start to see any improvements? This depends on the consistency of the consumer to take the supplement. The manufacturer claims that in four weeks you can start seeing some changes if the pills are taken consistently. 5 Q. What are VitalBiome Side Effects? Each bottle of VitalBiome contains 30 capsules, which currently costs around $64 and $21.41 for bulk purchases of 10 plus items. This is a product that is said to deal with the harmful bacteria in the gut that inhibits full digestion of food. The partial digestion is the reason most people experience bloating issues, gas problems and other digestion issues. Plexus VitalBiome is a product that is said to enhance the gut flora that subsequently helps the body in fighting the harmful bacteria in the gut. When the harmful bacteria is dealt with, cases of bloating and gas are minimized or done away with entirely. This, in turn, brings back the relaxation of the digestive system that was robbed by digestive problems. The product is also said to have compounds that can aid in weight loss by lowering cholesterol levels. The supplement is also claimed to boost the mood of the user, relieve anxiety and stress too. In some cases, the product is also said to deal with the depression. However, the price of this product may be too high for some people who would want to use it. This, in some cases, can be a non-issue since it is claimed that the product can work magic to the digestive system. Another shortcoming of the product is that it may cause some side effects to some people. The manufacturer, however, claims that these side effects are bound to disappear within a short time.